Smith’s Rose & Mandarin Lip Balm is the Perfect Citrus for Lips! I’d like to think everyone has those products that take them down memory lane. Many moons ago I purchased a Smith’s Rosebud Perfume Co. Rosebud Salve at the checkout counter at Sephora. I remember I was specifically at the Downtown Disney location in California & there was some kind of special where I needed to spend 5 more dollars. Back then…this was likely the most affordable thing in all of Sephora so it was meant to be & I’ve been enjoying the various flavors ever since! This year they broke out a new one- Rose & Mandarin…& I was right on top of it! Like the first balm I bought many years ago- I purchased this one in a tin. I know some people hate that & to you I say- no worries! They actually just released a convenient tube form which is pretty sweet! They didn’t have the tube which I purchased mine so I have the original tin format spiced up with some lovely artwork. & I totally dig it. Looking at both I think I still would have gone with the tin because I just love the look. So how is the balm compared to others? I actually find this balm to be a but softer than my other Smith’s Rosebud Perfume Co. salves & maybe a touch more glossy? The scent & flavor is absolutely intoxicating- absolutely mandarin! It reminds me of peeling a real orange & even a bit of zest. I seriously love the burst of citrus so much! This particular balm also has a sheer peachy color as well which is perfect for summer. Basically- a new favorite! I can never have too many balms or salves, how about you? 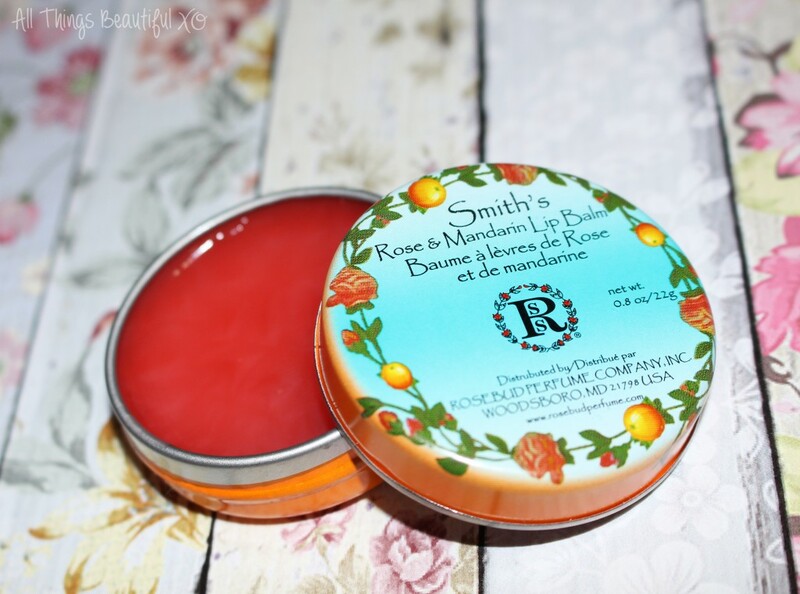 Have you tried the new Smith’s Rosebud Perfume Co. Rose & Mandarin Lip Balm? I’d love to hear what you think!